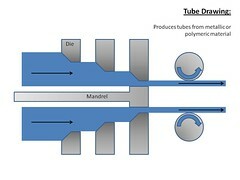 This resource is a diagram of a process used to produce tubes and pipes. (Slide 2 of 3). Image courtesy UKCME, the University of Liverpool.